A small band of zealots and one lone bureaucrat are trying to secure the region’s locally grown produce for the community. It hasn’t been easy. The décor in Bob Thomson’s downtown office gives off a certain administrative je ne sais quoi . No pictures are on the walls and only a small plate of peanuts adorns his desk. The sparse surroundings are hardly inspiring for the person responsible for thinking about the city’s food supply. As the only paid member of Ottawa’s Food Security Council, Thomson, until recently, was charged with convincing people that having access to locally grown fresh produce is now seen as part of any enlightened city’s “food security”, as a means of making sure that local communities can feed themselves. When I inquire what the council has been up to lately, Thomson pulls down a sheet of paper off the bulletin board– a map of eastern Ontario dotted with farms and farmer’s markets. He has been working on this map for over a year. Charting area farms as part of the council’s buy-local campaign is more challenging than it seems. Some farmers don’t want to be listed on Thomson’s map; vigilant food security council members want farmers with certain kinds of unregulated products left off. One young farmer, Hilary Chop, would go so far as to suggest putting Ottawa’s Byward Market on the sidelines. According to Chop, the city’s famous outdoor market is not much different than an open-air Loblaws, a clearing-house for imported produce. “Including places that are buying and reselling food -to me it just defeats the purpose,” she says. For Chop, home is where the vegetables are; she sells her hand-harvested tomatoes, potatoes, and fresh beets to a group of local residents and business owners she knows by name. She runs a CSA or Community Supported Agriculture, an arrangement that allows individuals to buy shares in a farm, connect to the people who grow their food, and provide farmers with a predictable income. From the beginning of the growing season until winter settles in, Chop feeds her members with the weekly dividends: summer squash, swiss chard, carrots and rutabagas. On paper, it would seem that all of the ingredients are in place for Ottawa, an amalgamated city now comprised of more than 80 per cent rural areas, to join the ranks of Berkeley CA, Hartford Conn., and even Toronto as cities that champion access to locally-produced food. No one disputes the fact that locally grown food helps to build healthy, self-sustaining communities. No one disputes the claims that the closer the distance from harvest to plate, the more nutritious and delicious produce will be. So why can’t the different voices in Canada’s capital city get together to put food security on the map? If you ask Bob Thomson, he’ll tell you to walk a mile in his shoes, and watch food security meet food politics. 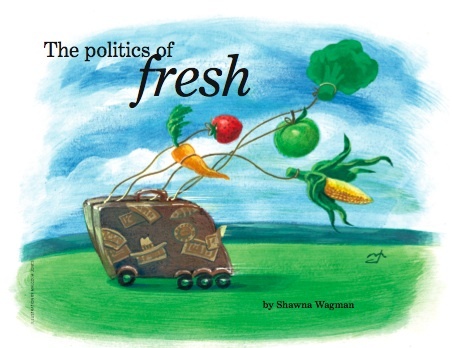 When we hear the term “food security”, the rash of recent panics comes to mind: tainted meat scandals, genetically-modified “frankenfoods” and the Walkerton water crisis pop to mind. Protecting the integrity of the food supply from a chemical or biological attack now falls under the purview of the U.S. Department of Homeland Security, the agency created in the aftermath of September 11th. In Canada, food security issues arose not out of fear of terrorism but as part of the country’s war on poverty that was underway well before the attacks. In 1996 Canada participated in the World Food Summit, a U.N. sponsored initiative to reduce the number of hungry and undernourished on the planet by 2015. The summit determined that “food security exists when all people, at all times, have physical and economic access to sufficient, safe and nutritious food to meet their dietary needs and food preferences for an active and healthy life”. That’s a big concept for cities to chew on, which is why food security councils are frequently misunderstood. At its most basic level, the role of the councils is to broaden the discussion of food security to include everyone who has had a hand in what we eat–from farmers and bureaucrats to chefs and retailers. However, critics charge that these councils represent another level of bureaucracy devoted to pie-in-the-sky propositions. Hearing of the establishment of Ottawa’s food security council last year, Citizen columnist Randall Denley characterized the project as “laughable twaddle” and “lame-brained”. He further maintained that the city had no business wasting money ($20,000 annually) and staff time (one part-time co-ordinator) dealing what he called “the bottomless pit situation like so-called hunger”. Denley was right about one thing: Ottawa-area farmers produce more food than the amount being consumed in Ottawa. In that sense, there is no food shortage. Ironically, Denley also inadvertently supported a key argument for the existence of a food security council: Ottawa’s population isn’t accessing much of its locally produced food. One study identified $38 million of untapped local markets for local food products in the Ottawa area. When I asked Thomson how Ottawa measures up in terms of food security, he presents a study that was initiated in 2001 by a handful of local nutritionists. The report delivers a snapshot of local food production, food retailers and suppliers in the new city of Ottawa. The diagnosis was bleak: a large proportion of the city’s residents were at risk for food insecurity. Within weeks of becoming the council’s co-ordinator Thomson realized his first hurdle was not going to be bringing together the stakeholders or launching a buy-local campaign, but convincing people to think about where their food comes from – and that would prove to be the one thing that the City of Ottawa isn’t prepared to do. A trip downtown to the city’s largest public market helps explain why. That means, for much of the last decade, people who shop at one of the city’s most enduring symbols of farm-fresh produce have had no real way of knowing whether or not they’re supporting a farm in Quebec or California. Which might help explain why the Food Security Council’s buy-local map is still under construction. It is one thing to raise consumer awareness about the value of buying local, but quite another to wade into the government’s messy relationship with local farmers and food purveyors. So when Thomson comes along with a plan to help increase the demand for locally-produced food in the city, he discovers that the city itself is unable to truly support it. For now, it is neither the government, nor the food security council that is making the biggest impact on Ottawa’s food security. It is the people of Ottawa, hungry for local produce and contact with the people who grow it, who are unwittingly taking food security matters into their own hands. Whether planting an heirloom variety of lettuce as part of a 70-square-foot plot in a community garden (the solution for more than 400 people without space to garden in downtown Ottawa) or delivering fresh produce boxes to families who would otherwise rely on canned vegetables from a food bank (via a program called the Good Food Box), the people of Ottawa seem to be fighting quiet food revolutions of their own. Back in Bob Thomson’s office the members of the Ottawa’s Food Security Council are meeting for their monthly roundup on the buy-local campaign. As the discussion gets underway, Thomson brings up a recent news story about a group of farmers in Lanark County who have staged protests against some food safety policies. They argue that the government’s inspection process on food items like meat and eggs is interfering with the farmer’s ability to sell directly to consumers. To protest, farmers have been selling their “illegal” food to anyone willing to buy it. “It’s a really, really, thorny problem”, says Thomson. The members of the council are divided on what to do. Some think the council should jump into the fray by organizing public discussions on issues that have an impact on food security. Others, like Thomson, believe the council can’t afford to get involved. The debate gets to the heart of the real challenge that lies ahead as the council moves into its second year: defining its role. There is no doubt that the first year of such an ambitious project will be fraught with growing pains, but without achieving solid agreement on whether the council sees itself as a community educator, a mediator between rural and urban communities, an advocacy group for sustainable agriculture or a non-partisan facilitator, one thing is becoming clear: not much is getting accomplished. The Council’s first growing season has come and gone. The only farmer who has ever agreed to sit on the council, Hilary Chop, has resigned. And the un-finished draft of the buy-local map is still posted on Thomson’s bulletin board. Food security seems to be as much about consumers who are insecure about the food they eat, as the farmers who are insecure about the people who eat the food they produce. Getting everyone around the same table seems to be a challenge for the Food Security Council. Perhaps a visit to one of the city’s CSAs, organics markets or food co-ops could show them how it’s done. As this article was going to press, OCM discovered Bob Thomson had left his role as co-ordinator to take a job in Europe. Council member Moe Garahan stepped into the role for four months at which time funding decisions will determine the fate of the Ottawa Food Security Council.